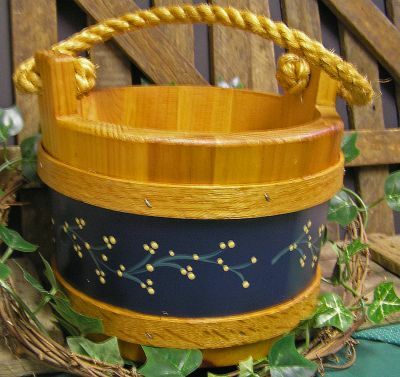 This solid wooden bucket is Amish made, has a wooden lid and a rope handle. It is hand painted in several designs: Black with Berries (shown), Maroon with Sheep and Blue with Snowman (this design in Snowman category). Other designs are on shown on the other buckets in this catagory. It measures 7 x 5 1/2 plus handle. 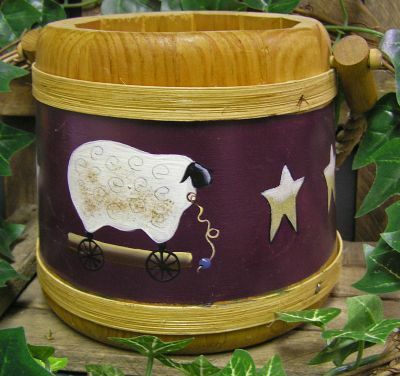 These Amish made wooden buckets feature our original hand painted designs and have rope handles. 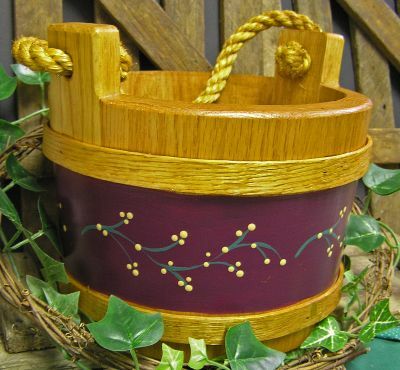 They are available in: Maroon with Berries (shown), Blue with Berries (click on photo), Black with Berries (shown on Sugar Bucket), Maroon with Sheep (click on Sugar Bucket photo), and Blue with Snowmen (shown in Snowman category). They measure 8 x 8 plus handle. This wooden shelf features a drawer that is hand painted with a unique Manchester Cottage design. 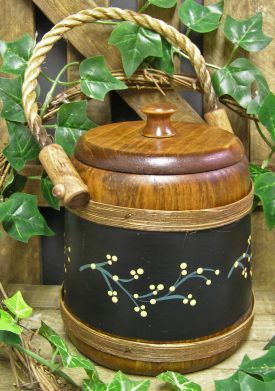 It has a berry and leaf pattern on the front and a wooden knob. It measures 9 x 19 x 7 1/2 and the drawer measures 3 1/2 x 15 x 6. These hand painted wooden chests feature designs unique to Manchester Cottage. 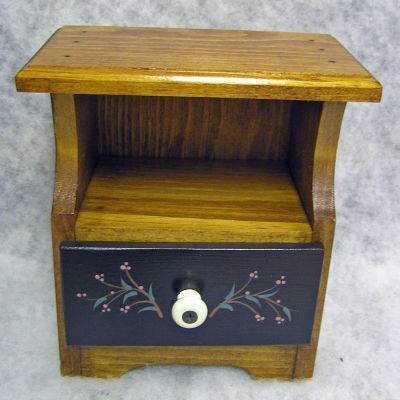 They come in two designs: berry (shown) and sheep (click on photo to see this option) and have a drawer and small shelf above the drawer. They measure 7 1/2 x 7 x 4 1/2. 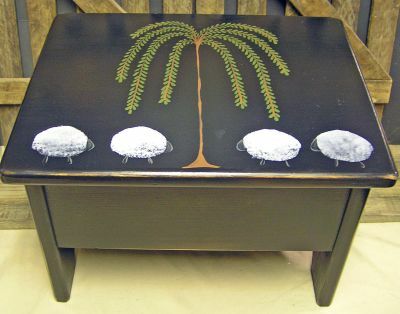 This wooden chest is hand painted and with a unique Manchester Cottage design. 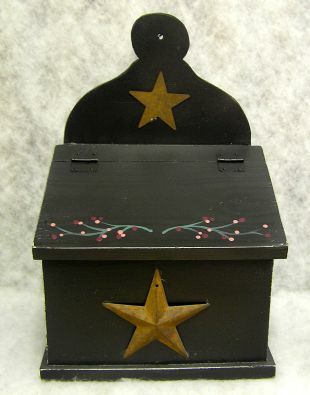 The base of the chest is painted black with a worn finish. It measures 9 x 14 x 10 1/2. 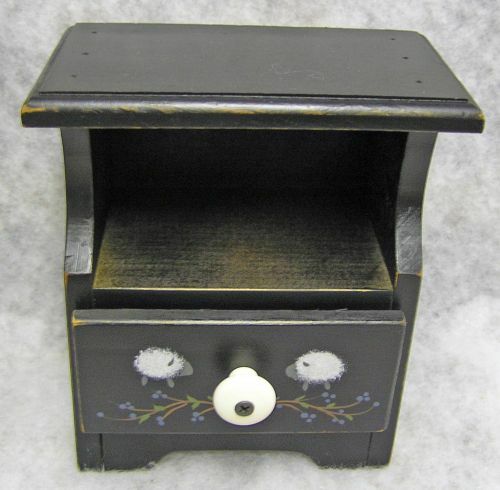 This rustic finish black wooden recipe box is one of Manchester Cottage's original designs. It features a hand painted berry design on the top, and a rusty tin star on the front and at the top. It measures 12 x 8 x 5 1/2. 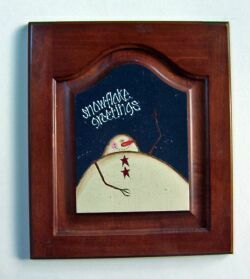 This hand painted door is cherry wood and is available in the snowman design. The cherry snowman door measures 14 X 12 X 1. 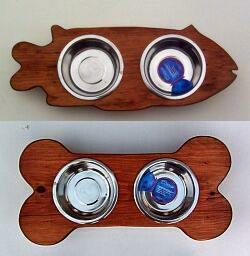 These are wooden stands with 2 metal dishes. 3 1/4H x 8W x 24L. 3 1/2H X 10 1/2W X 24L. 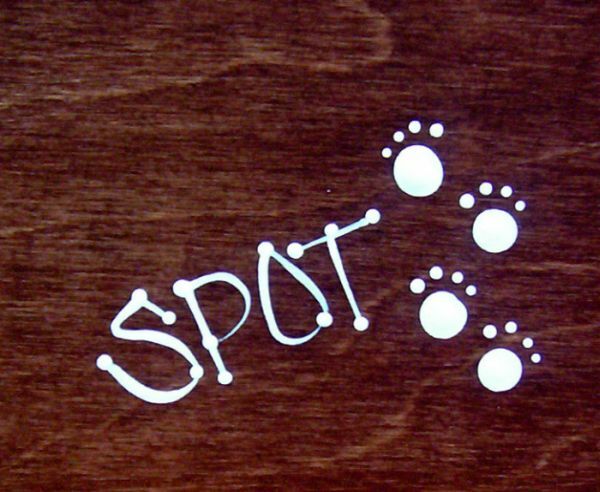 The dishes can be personalized for no additional charge. Please e-mail us with the name you would like (click on photo to see personalization sample).